If only rocketry pioneers Wernher von Braun and Sergei Korolev had lived to see this! 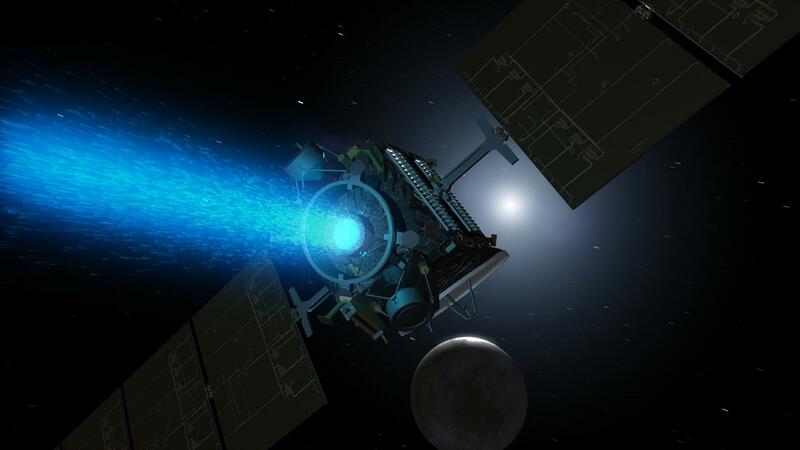 The NASA Dawn mission reached its target not with a conventional rocket engine, but with a propulsion system that slowly but constantly accelerated the probe using a concentrated jet of ionised inert gas (xenon). The Dawn spacecraft set off on en route to Vesta and Ceres, the two most massive objects in the main asteroid belt, on 27 September 2007. The investigation of these two large bodies, which offer valuable information about the earliest period of the Solar System, is of fundamental importance to understanding the origin and evolution of Earth. DLR is responsible for evaluating the images, processing the stereo-image data into global maps, and generating digital terrain models from which the topography of the two bodies can be derived. Ten years ago, NASA's Dawn space probe embarked on a mission destined to become one of the most exciting and scientifically productive in the history of the unmanned exploration of the Solar System. Dawn has explored two of the largest bodies in the asteroid belt: the asteroid Vesta and the dwarf planet Ceres. On board is a German camera system – the 'framing camera'. The camera was specially developed for this mission by the Max Planck Institute for Solar System Research, the DLR Institute of Planetary Research and the Institute of Computer and Network Engineering at the Technical University of Braunschweig. DLR is responsible for evaluating the images, processing the stereo-image data into global maps, and generating digital terrain models from which the topography of the two bodies can be derived with a precision of a few metres. Dawn is the first space probe that has been put into orbit around two different celestial bodies in the Solar System. Target 1: Vesta, an asteroid with a diameter of around 500 kilometres; Target 2: the dwarf planet Ceres, with a diameter of almost 1000 kilometres and the largest body in the asteroid belt. And although the expectations of the mission were met and exceeded a long time ago, Dawn's fuel reserves will allow the probe to continue investigating Ceres until at least mid-2019. Both targets, Vesta and Ceres, have astounded the approximately 50 scientists in the team – which includes several DLR researchers – with an abundance of surprising and significant discoveries, providing insight into the early Solar System. The one-ton research probe was launched into space from Cape Canaveral in the United States on 27 September 2007. At first, things progressed at a comparatively leisurely pace. This was because Dawn was accelerated out of Earth’s orbit with an ion thruster. Unlike a conventional rocket engine, which uses a chemical combustion process to generate thrust, an ion thruster ionises inert gas using electrical energy. The charged xenon ions can then be concentrated using a magnetic field and expelled in a targeted way. The generated acceleration is weak, but the thrust can be sustained for months or years. The three engines on board Dawn have a thrust of 90 millinewtons – about as strong as a sheet of paper falling to the floor. But when applied over a long period, the thrust builds up to a speed comparable to that of a conventional rocket engine. The probe has some of those on board as well, in the form of small steering nozzles that are used for course correction, but primarily for slowing the probe down into its orbits around Vesta and Ceres. About 425 kilograms of xenon was initially stowed on board for the ion thrusters – much less mass than would have been needed with conventional fuel. The energy for starting the ionisation reaction with the inert gas is provided by two large solar panels with a span of almost 20 metres. Like the European comet chaser Rosetta, Dawn initially increased its momentum in the inner Solar System until its two identical cameras laid eyes on its first target – the asteroid Vesta – four years later. The expectations were great, as there was still much to learn about these minor planets. Vesta was the fourth asteroid to be discovered, by Heinrich Olbers, a doctor and astronomer from Bremen, in 1807. In those days, astronomers were looking for a planet that they suspected was in the 500 million kilometre-wide gap between the orbits of Mars and Jupiter. At the beginning of the 19th century astronomers Franz Xaver von Zach and Johann Hieronymus Schroeter founded the Himmelspolizey ('sky police'), an international research collaboration, specifically to look for this 'gap filler'. A total of 24 European observatories were each given a quadrant of the ecliptic – the orbital band of the planets – for a sky survey. The search was successful in 1801, when Giuseppe Piazzi at the Palermo Astronomical Observatory discovered a large body somewhat by chance. It was given the name Ceres. But it soon became clear that the orbital gap was not just home to one planet, but dozens – today we know that hundreds of thousands of rocky objects circle the Sun in orbits similar to those of the planets. Due to its gravitational pull, Jupiter, the most massive planet and ‘guardian’ of the inner Solar System, prevented the formation of a planet from these bodies, which range in size from a few dozen metres to several hundred kilometres. Until Dawn's arrival at Vesta, the only image we had of this asteroid was a few pixels in diameter, taken by the Hubble Space Telescope. In addition to this, spectral measurements were available that indicated the reflective properties of the surface in visible light and the near infrared. Surprisingly, the information on its composition obtained from the spectral measurements resembled that of several meteorites in collections on Earth, leading to the deduction that material had been ejected from Vesta during collisions with other asteroids, and that a tiny fraction of this material had landed on Earth as meteorites. Confirmation of this by spectral measurements taken in the direct vicinity of Vesta would mean that we had samples of the asteroid in our laboratories. This would be enormously important reference material because asteroids are in essence ‘impeded’ planets, and the early period of planetary formation can largely be reconstructed from them. And so it was: The spectra of Vesta recorded by Dawn confirmed that the howardites, eucrites and diogenites – the exotic-sounding names for the meteorites found on Earth – come from Vesta and its fragments, known as Vestoids. Today, we even know with a degree of certainty which region on Vesta they come from. The two cameras on board Dawn showed a structure unlike any discovered on other celestial bodies. With a diameter of around 500 kilometres, Vesta initially formed as a spherical body as it reached what is known in geophysics as 'isostatic equilibrium'. But a large part of Vesta was 'missing' at its south pole, torn away in two gigantic collisions. Among the evidence for this is a 450 kilometre-wide circular rim surrounding a basin-shaped, eight kilometre-deep depression. In the centre is a huge mountain, which formed as a result of the rebound of the rocky crust reacting elastically under high-impact energies. It is a 22 kilometre-high massif, almost three times the height of Mount Everest! The Dawn probe orbited its first target for over a year. The team of scientists was overwhelmed by the variety of complex geological and tectonic features. Vesta is located close to the inner edge of the Main Asteroid Belt. In the first few million years of the early Solar System, very high temperatures reigned in that region, where the planetary embryos – planetesimals – first formed and quickly grew into large bodies. Volatile matter, such as water and gases, could not be integrated into the planetesimals and instead were driven to the outskirts of the rotating disc of dust and gas. Vesta also had to be a body that is comparable with the four terrestrial planets of the inner Solar System, with little water in its interior, but rock and metal instead. 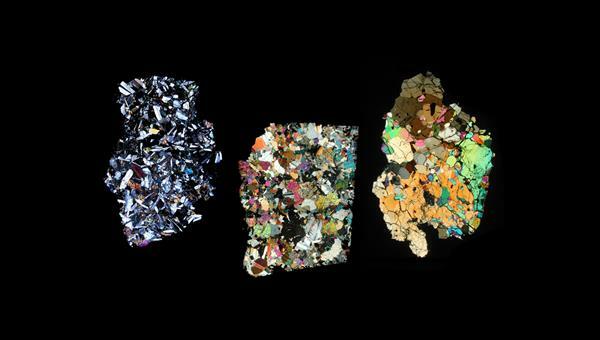 The meteorites from Vesta also contain these elements. Vesta is evidently the miniature version of a 'real' major planet – with a core of iron and nickel, a mantel of heavy silicate rocks, rich in magnesium and iron, and finally a lighter crust. It is even possible that volcanic eruptions once occurred on Vesta as can be deduced from several darker areas on the surface. Delighted by the treasures unearthed at Vesta, mission scientists directed the space probe towards its second target, the dwarf planet Ceres, in September 2012. 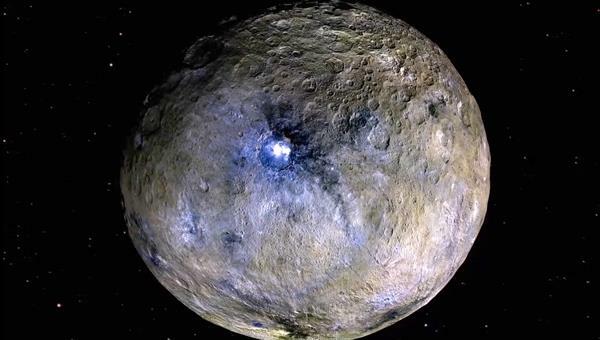 Located almost on the outer edge of the Main Asteroid Belt, researchers were expecting a very different type of 'minor body', Ceres being the largest and most massive body in this region, after all. Its size and spherical shape were the main reasons why the International Astronomical Union bumped the asteroid to 'dwarf planet' in 2006. During its journey, the probe crossed an invisible divide, known by scientists as the 'frost line'. Beyond this hypothetical line in the protoplanetary disc of gas and dust, temperatures were low enough for gases to condense into solid icy grains and become part of the material resources of the bodies forming there. However, not much was known about Ceres either. The best telescopes only resolved enough to make very rough regional structures recognisable. From the mass and orbit of the dwarf planet, it could be concluded that a considerable proportion of Ceres must consist of ice. The slow approach to Ceres in early 2015 was a hard test of patience for the team. As the image resolution finally enabled the identification of details in the large craters, there was something of a surprise: Very bright, almost snow-white, spots could be seen in some places. What were they? Ceres does not even reflect one tenth of the incident sunlight, so its surface is much darker than Vesta's, and the scientists had not expected bare ice on the surface. The riddle could not be solved during the initial mapping orbit at 13,000 kilometres, which was still too far away. More patience was required, until the probe dropped to its two lower orbits as close as 375 kilometres from the surface and was able to capture higher-resolution images as well as – most importantly – more detailed spectral data. The result was spectacular. The white areas appeared to consist of salty deposits, such as soda (sodium carbonate), magnesium sulphate and even ammonia-containing clay minerals, in addition to other sulphuric salts and chlorides. This means that there must be a process that partially melts the water ice clearly existing in Ceres' interior, and enriches it with mineral salts. It is forced up to the surface as brine, where the salty solution freezes immediately and the water evaporates. The heat required for this might come from the decay of radioactive elements in the dwarf planet's interior, but this question has yet to be conclusively answered. It is also generally accepted today that so-called cryovolcanic processes must have occurred on Ceres in the geologically recent past. This is a form of volcanism in which warm, hydrothermal mineral water with dissolved salts – instead of scorching molten rock – are pushed up to the surface. Salt crusts are left after the water has evaporated. 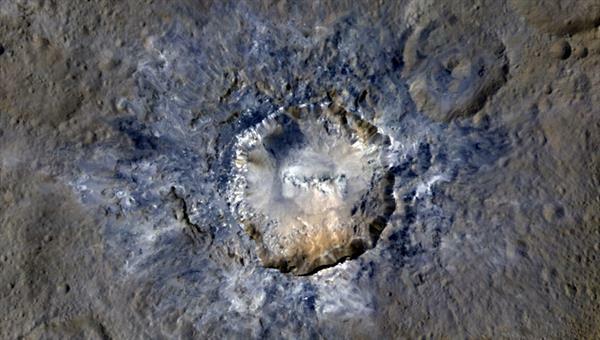 The Herschel space telescope discovered water vapour around Ceres in 2014. Its low overall density of barely two grams per cubic centimetre is also a strong indicator that Ceres must have a high proportion of water (up to a quarter of its mass). 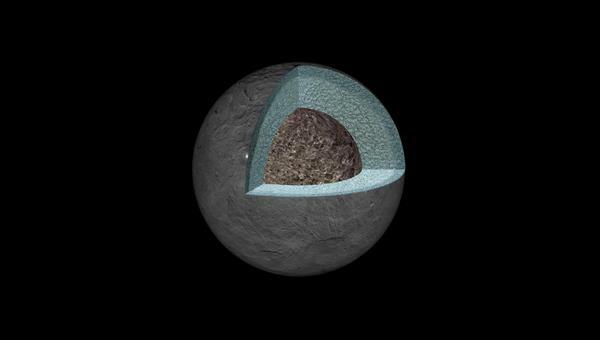 And, like Vesta, Ceres could have a differentiated interior, to a certain degree, with its iron-rich rock components, probably pure metals at its core, surrounded by a mantle of ice and surrounded by a crust of water ice and light, partially hydrated 'dry' (clay) minerals with a proportion of ammonia. As the bright deposits are generally located in craters, it is also conceivable that energy for hydrothermal processes taking place beneath the surface arises from the impacts that formed these craters. 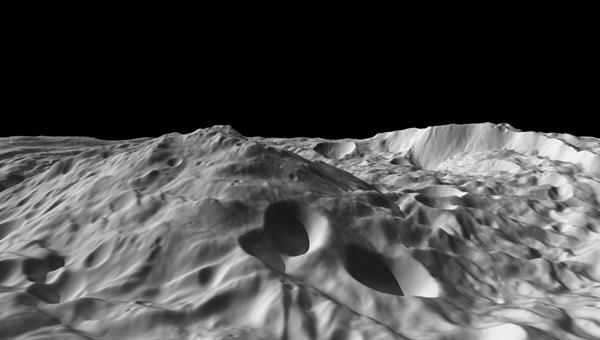 But there is yet another scientific and aesthetic controversy: The most unusual landscape feature on Ceres is a mountain that, at first glance, is reminiscent of potash-mining slag heaps. Ahuna Mons has a base diameter of 20 kilometres and rises an impressive five kilometres above its surroundings. Ceres has its own Mont Blanc, albeit with very even slopes and gullies that are thought to have formed from the slippage of silicates and carbonates. In general, Ahuna Mons is similar to volcanic domes on Earth. So, is it a cryovolcano – a construct of ice, salt, carbonates and hydrated minerals that get the necessary upward thrust from heat and density differences in order to rise up and form a mountain? It appears so. Presumably, the ice in the mountain evaporated long ago, so only dry minerals are left. 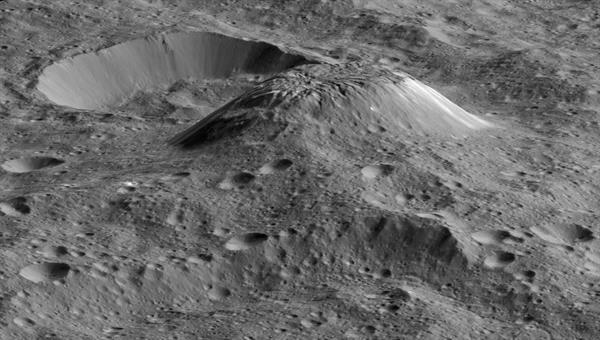 However, there is no other mountain like it on Ceres. Dawn continues to orbit the dwarf planet. This could be the case for years to come. The orbit around this body, with its homogeneous mass distribution and barely any fluctuations in its gravitational field as a result, can be kept stable with almost no fuel. The probe should 'live' until 2019. This is when Ceres reaches perihelion, its closest distance to the Sun along its orbit. There is reason to hope that, with the increase in solar radiation at that point, some of the ice in the dwarf planet's crust will sublimate and even that active cryovolcanism might be observed. This would be the final highlight of a mission rich in discoveries. Dawn is a NASA mission. It was so named to present the purpose of the mission: to provide information on the dawn of the Solar System. On board the probe, controlled by the Jet Propulsion Laboratory (JPL), are a visible and infrared spectrometer instrument, a gamma-ray and neutron detector instrument and two identical cameras. The framing camera was developed by the Max Planck Institute for Solar System Research, the DLR Institute of Planetary Research and the Institute of Computer and Network Engineering at the Technical University of Braunschweig. DLR is responsible for evaluating the images, processing the stereo-image data into global maps, and generating digital terrain models from which the topography of the two bodies can be derived. The asteroid Vesta orbits the Sun in 3.6 Earth years, following an elliptical orbit between 322 and 385 million kilometres. The average diameter of the third largest asteroid is 516 kilometres. The asteroid is named after the Roman goddess of the hearth, the home, and domestic life – the sister of Ceres. Ceres, named after the Roman goddess of fertility and agriculture, is the largest body of the asteroid belt with an average diameter of about 950 km. Ceres was designated as a dwarf planet since 2006. It circles the Sun in 4.6 years, following an elliptical orbit between 384 and almost 450 million kilometres.